Sharp Energy is an aspiring and caring company. We are a subsidiary of Chesapeake Utilities Corporation (NYSE: CPK) and one of the largest propane companies in the Mid-Atlantic Region, yet we offer the kind of personalized customer service you won’t often find with a company our size. We are proud to serve 37,000 customers from 10 customer service centers, conveniently located in Delaware, Maryland, Virginia and Southeast Pennsylvania, and managed and operated by your neighbors. Sharp Energy delivers over 40 million gallons annually in combination with residential, commercial, industrial, wholesale and AutoGas. Sharp Energy continues to research the latest advances in green energy and aspire to seek out opportunities to incorporate these innovations into our products and service offerings. In continuing with our mission, we are proud to partner with Alliance AutoGas. Since Sharp Energy is a member of Alliance AutoGas, we are part of a national consortium of companies providing an industry leading complete program for fleets interested in shifting from gasoline to clean-burning propane AutoGas, the world’s most popular alternative fuel. 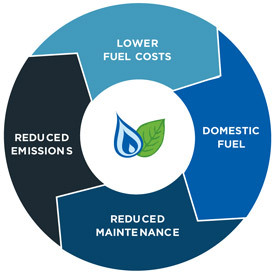 AutoGas is the best fit alternative fuel for light to medium duty vehicles. AutoGas can be used in any size fleet and can be used in any location. Sharp Energy and Alliance AutoGas install and support propane vehicle conversion systems for vehicle fleets. Sharp Energy continues to convert fleets to bi-fuel propane powered engines. It is our sincere hope that we will be able to bring this and other environmentally friendly products to our loyal customers in the future. To learn more about the future of propane powered vehicles, visit the Alliance AutoGas website at allianceautogas.com. Sharp Energy Cares about preserving the environment for future generations.